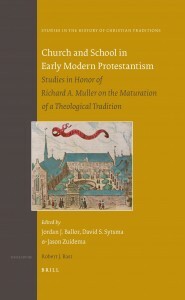 Two years ago, on the occasion of his 65th birthday, Brill published a Festschrift for Dr. Richard A. Muller, senior fellow of the Junius Institute, co-edited by myself, David Sytsma, and Jason Zuidema. The contribution that Richard Muller has made to the study of early modern Protestant theology is little short of astonishing. A brief look at the full bibliography of Muller’s works, which appears towards the end of this excellent Festschrift, helpfully reminds the reader of the sheer breadth, subtlety and significance of his work. It is no exaggeration to say that he has transformed and enriched our understanding of the Reformed tradition to such a degree that much older scholarship seems to be addressing a quite different phenomenon. In Muller’s hands, early modern Reformed theology has become more diverse, more subtly textured, more intellectually flexible and ambitious, and much more closely related to the other intellectual trends of the period. You can read the entire review in the Journal of Ecclesiastical History.